Diabetes Self-Management magazine offers nutritious and tasty diabetes-friendly recipes and up-to-date, practical “how-to” information on nutrition, exercise, new drugs, medical advances, self-help, and the many other topics you need to know about to take control of your health. Want to try our calorie-conscious Harvest Bounty Dinner Menu, get tips for making tasty after-school snacks, learn how James Earl Jones manages his Type 2 diabetes, and more? 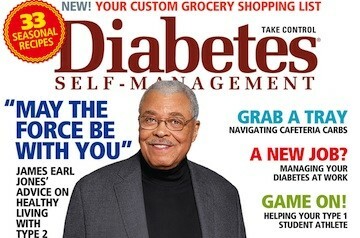 Then pick up the September/October issue of Diabetes Self-Management at Barnes & Noble or your local grocery retailer, or download it on your favorite device. And be sure to subscribe today and receive our award-winning, expert information all year long! Insulin sensitivity does not improve in women who lose weight eating a high-protein diet, according to a small new study from the Washington University School of Medicine in St. Louis. Bookmark DiabetesSelfManagement.com and tune in tomorrow to learn more.